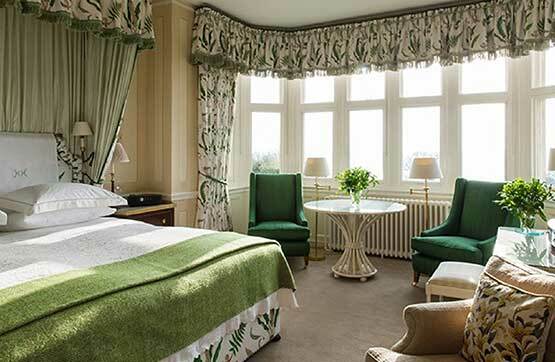 The larger of our two master bedrooms is decorated in green and white in a beautiful fern chintz. 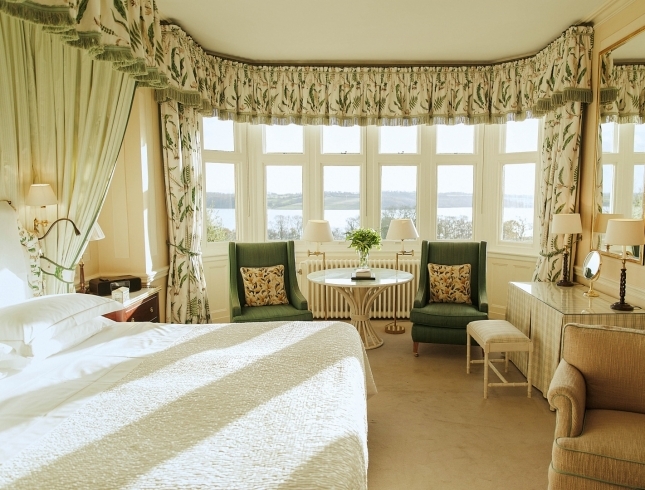 Fern has a huge bay window facing south across the gardens and Rutland Water. The walls were specially hand stencilled for us with bamboos and fern decorated ceramics. The bed has a canopy. There is a breakfast table in the window giving plenty of space for meals, writing letters etc, two comfortable chairs and a separate dressing table. 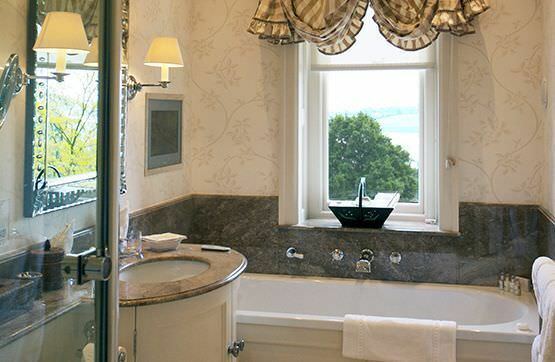 There is a large marble bathroom (11′0″ x 6′0″) with lake view, walk-in shower, large bath and the luxury of watching TV while in the bath. 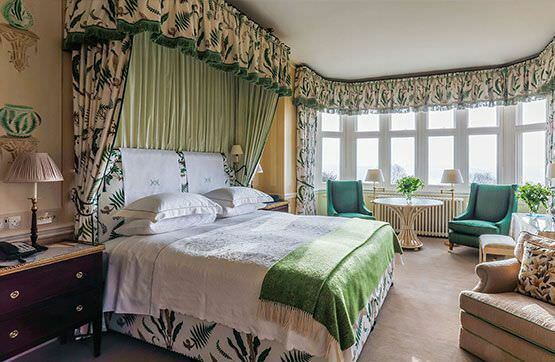 Our second biggest room in the main house has wonderful southerly views across the gardens and Rutland Water. A very sunny room, where walls are papered in Chinese 18th century design in blues and cream. 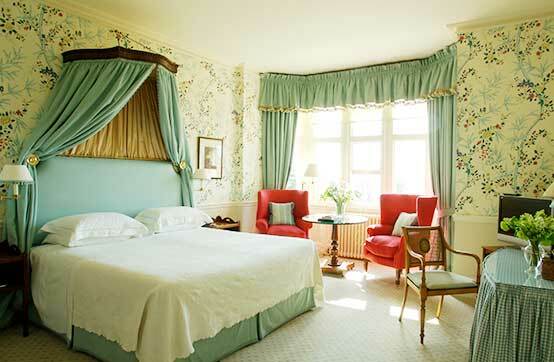 The 6′ wide bed has a French 19th century corona with pale blue curtains. 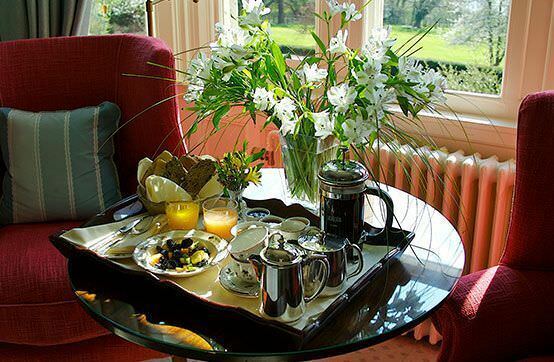 There are two comfortable armchairs, either side of a breakfast table in the window. Middlehurst has one of our largest marble bathrooms (11′6″ x 14′6″) with a twin washbasin, a mirrored wall, a good shower and a large bath. Can be let in conjunction with Blue with inter-connecting doors – making it perfect for families. There is a pretty dressing table with large mirror.